A new equine biosecurity standard is being developed in Canada to protect the horse industry from animal disease incursions. Equine Canada is working with the Canadian Food Inspection Agency (CFIA), Agriculture and Agri-Food Canada (AAFC) and other partner organizations to develop a farm-level biosecurity standard. A national Equine Biosecurity Advisory Committee has been established to develop this voluntary standard that will provide a common approach to preventing and controlling disease in facilities where horses are housed and kept. Biosecurity standards take up to two years to develop through a formalized process and participation from a broad cross-section of stakeholders, including government, academic institutions and industry organizations. “Infectious diseases are a real risk in the equine industry that we cannot simply neglect or eliminate, however we can manage them,” said Dr. Daniel Schwartz, Veterinary Biosecurity Specialist with the Animal Health, Welfare and Biosecurity Division with the CFIA. “The biosecurity standard is a tool to assist horse owners and custodians in protecting horse health on farms and facilities by minimizing the risks of the transmission of infectious diseases. 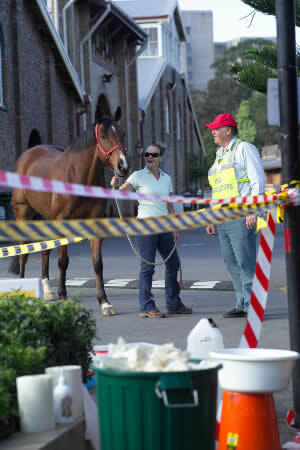 Horse owners and custodians, in consultation with their veterinarian, can use the biosecurity guidelines and best practices in the standard to develop a biosecurity plan to manage the risks on their farms and facilities. “Through the standard, we hope to ensure the health and welfare of Canadian horses and the success of Canada’s horse industry,” Schwartz said. The biosecurity standard will complement existing equine farm-level biosecurity programs while reflecting the diversity within the equine industry. Funding to develop the standard has been provided under the Growing Forward 2 Agricultural Policy Framework.